Kevin Finnegan and Kevin Goldberg met the first day of law school in 1993 at Catholic University. During their third year of law school, they worked as a team at the Columbus Community Legal Services Clinic and received the highest grades in the class. The "Kevins," as they quickly became known successfully represented a consumer in a civil lawsuit against Ford Motor Company on a breach of warranty claim for her defective automobile. The Kevins, decided that they would one day practice law together. Of course, at the time, they thought that this day would not be until some time in the distant future. Upon graduation, Kevin and Kevin each worked for different law firms, and were not satisfied with the minimal personal satisfaction that came with working as an associate. Instead, they decided to start their own law practice--- and in February 1997 Goldberg Finnegan, LLC was born. In early 1999, the Kevin's met Rob. Rob encouraged the Kevin's to get actively involved with the Maryland Trial Lawyers Association (MTLA) and the Association of Trial Lawyers of America, now known as the American Association for Justice. In getting involved, the Kevin's resurrected MTLA's New Lawyers Section. During their time with the New Lawyers Section, the Kevin's were responsible for, among other things, organizing and moderating several very successful seminars for MTLA. 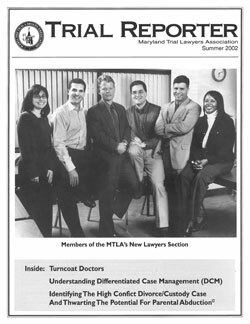 In fact, their efforts landed them on the cover of MTLA's Fall 2002 issue of Trial Reporter, a copy of which you can see to the left of this paragraph. Since their time on the New Lawyers Section's Executive Committee, the Kevin's remained friends and colleagues. When opportunity knocked where the Kevin's could work together in the same firm, they jumped at the chance and Goldberg Finnegan, LLC was born. The Kevin's look forward to a long relationship of aggressive representation and advocacy on behalf of those injured through the negligent acts of others.